Captain's Log Starship 1XE, Day 29 in the month March, Earth Calendar year 2018. Flying over an ocean of sand in the Mojave Desert of California, a postage stamp size parcel appears on the horizon. Its borders are square, signifying a man-made perimeter, and there are patches of green with a few buildings scattered on the 34,000 acres. This is the Cadiz Water Project. After a number of days flying press, supervisors, land management officials, concerned citizens, and various 'desert rat' activists over this tiny garden spot, the area took on a different aura. Picture a block of land with proverbial giant straws going deep into the aquifer and sucking this vast patch of desert of much of its last remaining water. On the surface a desert looks dead: nothing moving, no overt signs of life but on closer inspection there is an abundance of creatures that inhabit this land, and even the slightest amount of water brings startling results with insect and animal life cycles renewed, and explosions of blooming plants. A small company has plans. Cadiz Inc. is looking to pump as much as 50,000 acre-feet of groundwater a year from the Fenner Basin aquifer that lies under the Mojave Trails National Monument and Joshua Tree National Park. They want to utilize a nearby railroad right of way to pipe it across the desert to sell to cities in Southern California. As Cadiz itself states: Southern California has no water to waste. Recharge rates of water to aquifers in the area are only 2,000-10,000 acre-feet/year, according to USGS scientists. 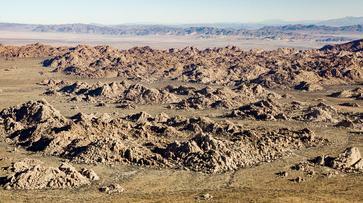 The Fenner Basin is a fragile ecosystem currently protected by the Mojave Trails National Monument. A study published last month confirms that the project poses serious threats to the largest spring in Mojave Trails National Monument. Deregulation, privatization and the concentration of power in the hands of the few might take strange new shapes in the coming decades, as water is a resource that is becoming increasingly stressed due a growing demand and climate change. A lack of effective water management is making this more of an economic and political issue. A few people will make a ton of money if this project ends up happening and the consequences to a vast and unique part of our planet will be compromised for a land owned by all Americans. Especially, in a time when water in the West is the new gold.